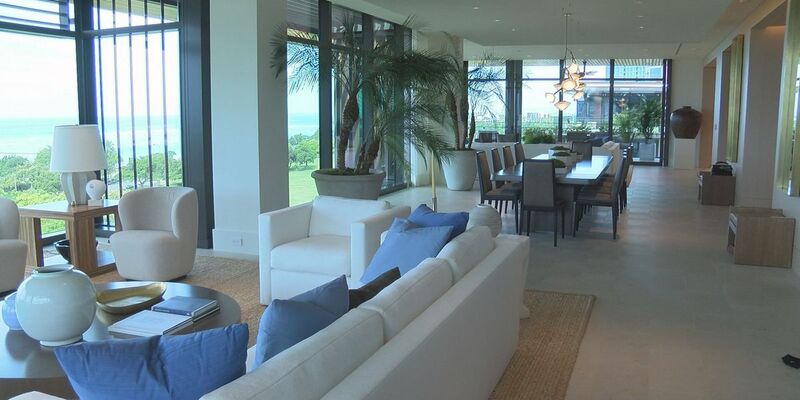 HONOLULU (HawaiiNewsNow) - The price tag for the last penthouse available at Park Lane Ala Moana is a hefty $29 million, but the panoramic view is priceless. "At this vantage point, you're able to feel the landscape of the area, feel the energy of the ocean," said Alana Kobayashi Pakkala, CEO of Kobayashi Group. At roughly 6,300 square feet of living space, the Hale Moana penthouse is the largest of 217 units. The condo has four bedrooms, four-and-a-half bathrooms, a designer kitchen, office spaces, walk-in closets and two separate lanais. "The floor is from Germany, limestone that's sandblasted and then brushed to give it a little bit of texture and softness," said Brett MacNaughton of The MacNaughton Group, which developed the project with the Kobayashi Group. The walls are white-washed oak that's been paired with a different shade of oak floors. Material for the interiors came from Europe. "I think it exceeded my expectations," Pakkala said. "Designing something that feels this open and feels so custom was a challenge. It took a lot of attention to detail." Park Lane Ala Moana has twice set the record for priciest condo sale in Hawaii. One penthouse sold for $18 million. Soon after, a second went for $22 million. Hale Moana is the crown jewel, sitting on the top floor of the center section and already fully furnished. "Typically, we don't furnish our units. We really felt that in order to showcase this beautiful residence, we really needed to complete it with furniture and art," MacNaughton said. He envisions a family that travels the world buying the unit. "It is clearly a home that was made for entertaining, but it's very homey. It has a calm, quiet warmth to it," Pakkala said. "You can imagine a family making memories here." Park Lane was designed like a five-star resort, complete with a swimming pool, workout rooms, theater and entertainment spaces. The Hale Moana penthouse is one of only eight units remaining for sale.